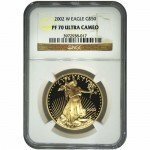 The American Gold Eagle is a coin that was first produced by the US Mint in 1986, and since then has remained one of the top gold coins in the world as far as popularity is concerned. 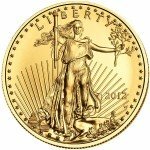 Interestingly enough, the American Gold Eagle’s appearance on the open market coincided with that of gold coins from many other countries around the world. These particular coins are graded as being in near perfect condition (MS70) by the NGC; one of the world’s most trusted coin-grading companies. Actual gold content of 1 troy oz. When looking at this coin, the first thing that comes to mind is the sheer beauty of the designs on both the obverse and reverse sides. On the obverse, you will find the iconic image of Lady Liberty. Lady Liberty looks identical to the famous statue found in New York City, though in this depiction she appears to be moving across the coin’s face and has a more lifelike feel. On the coin’s reverse, you will see the breathtaking image of an Adult Eagle delivering food to a nesting bird. Also on the faces of these coins you will find the 2015 year of minting, 1 oz weight, and $50 face value. Because so many Gold Eagles are produced on an annual basis, most people do not typically feel rushed to get their hands on them. 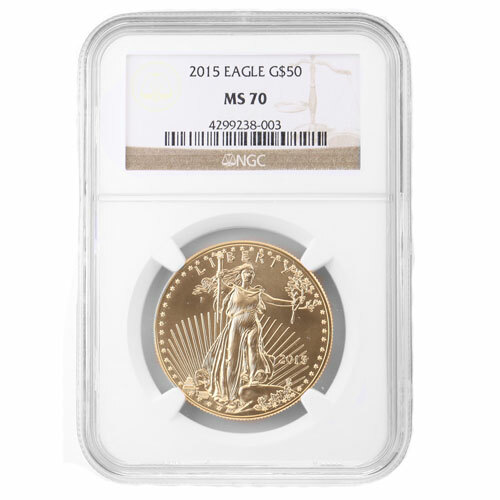 With these 2015 1 oz American Gold Eagles that have been graded as being MS70 by the NGC, there are only a limited number available so you should make a purchase sooner rather than later. 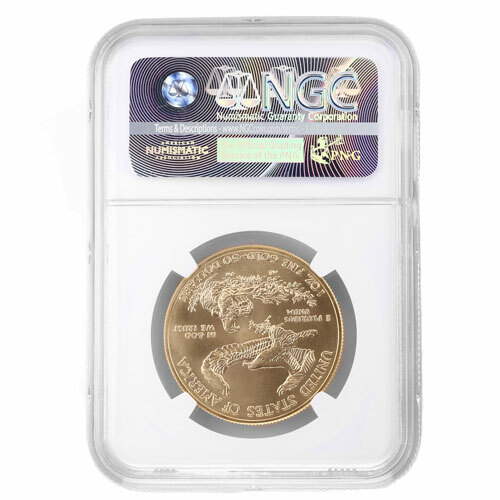 These certified coins ship in their protective slabs and are fully insured against any damage that may occur during transit. If you have any questions about these or any of our other certified US Mint products, we encourage you to reach out to customer service at 888-989-7223. In addition, you can also contact customer service via our live-chat and online contact forms.